Error message: Variations Specifics and Item Specifics entered for a Multi-SKU item should be different. A multi-sku listing is a listing with combinations, example a TShirt available in green, red & blue. Error message shows that some listing properties (called Item Specifics) are same on different combinations, and this is not allowed by eBay. Usually, Item Specifics that should be different from one combination to another are Product Codes. For example : eBay rejectes a product with same MPN (or EAN) for red & blue combination of a TShirt. 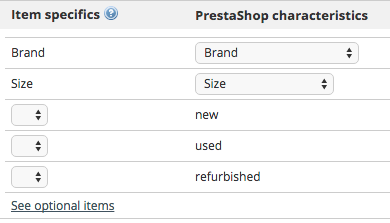 To make this error message go away, you must match eBay “Item Specifics” with PrestaShop characteristics, and ensure PrestaShop characteristics values are different for each combination.